Royal Enfield is leaving no stone unturned for the promotion of their upcoming 650-cc bikes. Royal Enfield is encouraging builders around the globe to come up with unique builds based on their Interceptor 650 and Continental GT 650 models. Here is one such build, and a short film based on it. 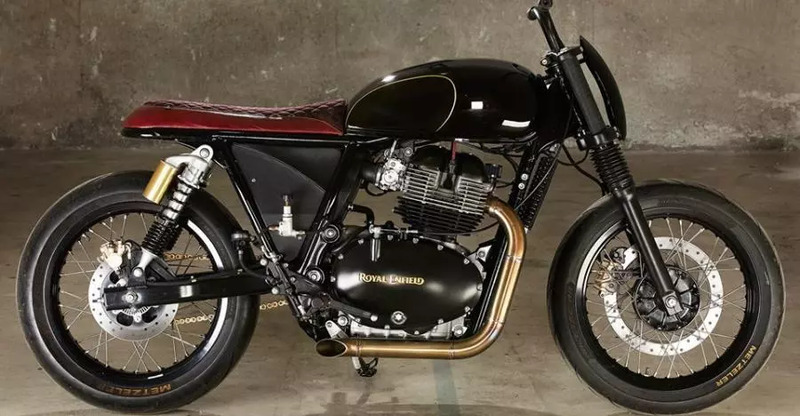 The build is showcased by Old Empire Motorcycles- a UK-based custom bike builder. The bike is based on the Royal Enfield Interceptor 650. The builder has gone in for a minimalistic design while developing this one-of-a-kind ride. The designers have only kept the necessary mechanicals and electricals, to achieve the minimalist look. The look has been carried forward in the wirings and controls set-up, with no extra wires in sight. The handlebar looks raw. The traditional locking mechanism has been replaced by a keyless ignition system to lose all those extra wires. The engine has been given the all-black treatment while exhaust pipes are finished in gold, which lends a neat contrast to the powertrain. The bike is finished in a deep red metallic shade with a touch of golden pinstripes on the fuel tank. With a little tweaks in the suspension, bike now sits a little lower on the ground. The engine powering this beautiful bike is a 646-cc parallel-twin petrol, which produces a peak power of 47 Bhp and 52 Nm of peak torque. This engine is the first unit from Royal Enfield to be mated with a 6-speed transmission and a slipper clutch assembly. The bike is capable of touching a top speed in excess of 160 Kmph. Royal Enfield will use this engine to power the café racer twin of the Interceptor 650, the Continental GT 650. Both the bikes are the most advanced bikes to roll out from RE’s production facility. Features, such as a 6-speed gearbox, standard ABS and slipper clutch assembly make these bikes more advanced then other Royal Enfield models. Royal Enfield is expected to launch the Interceptor 650 and the Continental GT 650 in India, in December 2018. The Royal Enfield interceptor 650 will be the cheaper variant of the two models. Prices of the Interceptor 650 are expected to start around Rs. 3 lakhs, while that of the Continental GT 650 could start from the Rs 3.2 lakhs mark.